Catalan elections: What alternative to secession? The results of the Catalan elections of November 25 show that a majority of Catalans are likely to vote in favour of independence in case a referendum is organised. However, this majority is not very ample and suggests that the high expectations that were put on these elections by national and international media were exaggerated. With an impressive turnout of 69%, more than 10 points above average, the citizens of Catalonia participated in what many called to be the most important regional elections ever held in Spain. But were they? Firstly, the party in power Convergencia i Unió was re-elected although with 8 points less which some see as a defeat but which can also be seen as success considering the severe social cuts it has implemented during the last 2 years in government. Secondly and like most elections held in times of deep economic crisis, there was a transfer of votes from centrist parties to the extremes -10 points- although not comparable with what has been seen in countries such as Greece. Thirdly, it is confirmed that more than a 2/3 majority of members in the Catalan Parliament support the organisation of a referendum to question the relationship between Catalonia and Spain. Only 21% oppose it. And fourthly and lastly, the results of the Catalan elections of November 25 show that a majority of Catalans are likely to vote in favour of independence in case a referendum is organised. However, this majority is not very ample; it oscillates between a bit more than 50% to a maximum of 70% depending on the vote of the supporters of those parties in favour of the consultation but who might vote in favour or against. Therefore one can think that the high expectations that were put on these elections by national and international media were exaggerated. At the end of the day, what did change when everything stayed more or less the same? and how will these elections impact Spanish politics? From a strategic standpoint these elections presented three approaches to the “Catalan problem” which can be summarised as follows; the Creation of a Catalan State (secession), the continuation of things as they are (status quo) and the reform of the Spanish State (federalism). After the results of the Catalan elections the first option is still the one with more support. The roadmap laid out by the president of the Catalan Government Artur Mas when he decided to dissolve the Catalan Parliament on September 20 and call for new elections will be amended according to the results of the elections but it continues to be implemented. The new Catalan Parliament will now start procedures to organise a referendum to question the citizens about a potential break-up from Spain. Therefore the option of the creation of a Catalan State is a clear and solid one. Then there is the option of keeping the status quo, defended by the two big Spanish parties Partido Popular (PP) and Partido Socialista Obrero Español (PSOE) together with a new fringe party called Ciutadans (C’s). So far the most effective tools used to defend the current Spanish Constitutional setting have been the fear of change and threats of losing the European citizenship, the euro, the pensions, and other unproven issues if Catalans leave Spain. This is an option that is tenable in the short term but it doesn’t offer a solution to neither the Catalan nor the Spanish problem. The last years’ escalation of tension between Catalonia and Spain as well as the proven inefficiencies of the Spanish system which are responsible for the dire economic situation of the country make this option unwise in the long run. Finally there is the federalist option, defended only by the Catalan branch of the Spanish Socialist party (PSC, 14% of the votes). As the slogan in the campaign said “Federalism –in Spain- is the sensible alternative –to Catalan independence-”. The problem of this approach is that the party that supports it has lost 4 points of support in this election –worst results in PSC’s history- and federalism has not been and still is not in the agenda of its mother party, the PSOE. And even if it were the other half of the country (PP) and the Spanish government is radically opposed to a Federal Spain. Hence the option of reform upon which depends the future of a united and viable Spain is not yet in the agenda. 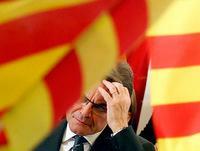 Therefore it should not surprise anyone that secessionism will continue to advance unchallenged in Spain. The success of the break-up option is based on the well-organised, peaceful and democratic process led by the majority of the Catalan civil society but it also owes part of this success to the lack of an alternative coming from a Spanish government that insists on an obsolete model of state. At the end of the day, an important point to bring home from the Catalan elections is not that Spain might break-up –the process of Catalan self-determination has accomplished but one more stage and will follow its path- but rather the fact that Spain, with or without Catalonia, lacks a plan to address fundamental deficiencies in the structure of the state. It is only fair that when the day of the referendum comes the Spanish and Catalan citizens know what is the alternative plan of the Spanish government to address the frustrations of the Catalans and what reforms are they willing to undertake to make all Spanish citizens feel welcome and comfortable within the state structure. The Catalan elections of November 25 confirmed that for the moment the only solid option on the table is the secessionist one. The sooner Spain understands the need for reform the more chances it will have to keep the country together. Joan Marc Simon is a board member of World Democratic Governance Project Association in Barcelona.